Panini released in November 2013 a sticker album about the history of the Brazilian National team in the official competitions: Copa America, World Cup and Confederations Cup. This album has a great design and it follows a similar format of the previously released Panini Santos 100 anos. The cover has a big logo of Brazil in relief and in hard material. There are a total of 300 stickers, out of which about 20 in fabric material and about 20 transparent stickers. 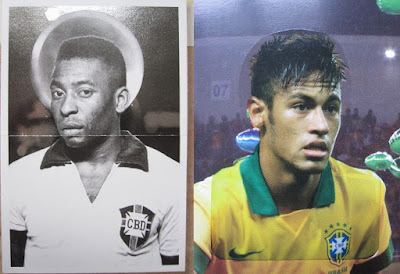 The collection starts with a foreword and the team photo (2 stickers) of the first match in the history of Brazil. Then an extendable page shows the table of contents on three pages. The first part is about the World Cup from its first edition in Uruguay in 1930 to its last event in 2010. The second part of the album shows the history of Brazil in the Copa America and in the Confederations Cup.